I find religion—and especially fringe religious movements—incredibly interesting. I don’t subscribe to any faith (for the curious, I’m an atheist, but that’s tangential to the rest of this piece), but the human search for answers—metaphysical, spiritual, or something else–to the “big questions” is something that I find compelling and confusing in equal measures. Perhaps my interest in religions old and new, as it currently manifests, is more akin to kudzu, a plant that gets all over EVERYTHING and has been known to do things like cover entire houses. But for those who are not quite at the kudzu-level of interest in religious movements, it can be hard to know where to start with reading about this sort of thing. So, here’s a list of some of the books that, for me, didn’t help to stop the intellectual kudzu growth so much as encouraged it. Righteous: Dispatches From the Evangelical Youth Movement (2005) by Lauren Sandler: I am both terrified and fascinated by evangelical Christianity, and Salon reporter Sandler’s book on evangelical youth movements in mid-2000s America shows us exactly how these extremist beliefs have taken root in a new generation. As Sandler details in her reports from youth gatherings as diverse as anti-abortion music festivals, a skater-centric mission, and the extremely conservative campus of Virginia’s Patrick Henry College, evangelical Christianity is not a fusty, old-style movement that Millennial believers are rejecting—paradoxically, many seem to be embracing it in droves. If you’re at all interested in the “culture wars” of the last 15-20 years, the current battles over reproductive rights around the nation, or are baffled by the appeal of pop culture-heavy evangelical churches like Seattle, Washington’s Mars Hill, look no further—Sandler provides a provocative look at the unlikely direction in which evangelical Christianity seems to be headed. Further reading: Jeff Sharlet’s 2008 expose The Family is a look at the extremely powerful faith-based group that has more influence on United States politics than many people know. Nation contributor Kathryn Joyce’s Quiverfull: Inside the Christian Patriarchy Movement (2009) paints an equally disturbing picture of evangelical gender politics—which are, perhaps unsurprisingly, extremely regressive and being emphasized right now by many prominent leaders of that movement. Underground (1997) by Haruki Murakami: Celebrated fiction writer Murakami interviewed hundreds of survivors of the 1995 Tokyo subway sarin gas attack perpetrated by fringe group Aum Shinrikyo, and this stunning, horrifying book is the result. Although the book does include a narrative of the events, it is less a meditation on Aum’s motives than a skilled, movingly told account of a deeply scary event that gives the reader insight into what it’s like to live through—and after—a very public trauma. It’s difficult for me to describe how incredible this book is without lapsing into hyperbole; it’s a powerful chronicle of how ordinary people react when faced with terrifying events. Further reading: Psychologist Robert Jay Lifton’s Destroying the World to Save It (2000) which places Aum and other apocalyptic faiths (including the Manson family, Jonestown, and Heaven’s Gate) in context with the “end of the world” strain in some religious traditions, and in the age of global terrorism. This is the book to read if you want a better idea of Aum leader Shoko Asahara’s rise to power, and/or how Aum has been influenced by Japanese culture and social mores. 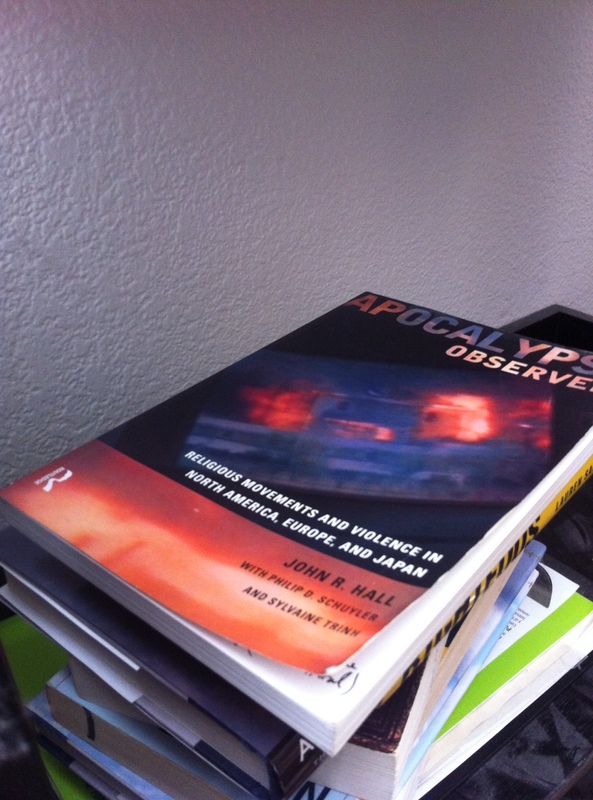 Apocalypse Observed: Religious Movements and Violence in North America, Europe, and Japan (2000) by John R. Hall, with Philip D. Schuyler and Sylvaine Trinh: If you’re familiar with some of the basic concepts in Sociology and/or Religious Studies—and are interested in how alternative religion/NRM activity relates to cultural anxieties about the 20th century ending, this is a fine book to pick up. Although the Jonestown material has been well-covered by this point (the primary author of this book, John R. Hall, also wrote a thorough academic study of Jonestown entitled Gone From the Promised Land), the chapters on Order of the Solar Temple and Heaven’s Gate are excellent in narrative as well as insight. A word of caution: This is pretty clearly an “academic” text in more ways than one—that includes the price–and a new copy will run you upwards of $50. Fortunately, used copies for a couple of bucks are not too hard to locate online. Further reading: Journalist Julia Scheeres’ A Thousand Lives: The Untold Story of Hope, Deception and Survival at Jonestown (2011) gives readers a nuanced, humanizing view of one of the most notorious post-1960s religious sects. Since “drinking the Kool-Aid” has entered the U.S. cultural lexicon since the sect’s mass death in 1978, many still believe Jonestown to have been a cut-and-dried case of mass suicide by vulnerable people who were all swayed, zombie-like, by Jim Jones and his message of socialist revolution via a self-reliant commune (in a former French colonial country, no less). But as Scheeres admirably shows, the members of Peoples Temple who died in the massacre were people—all with hopes, aspirations and dreams. Inside Scientology: The Story of America’s Most Secretive Religion by Janet Reitman (2011) is a behemoth of nonfiction and investigative amazingness. Rumor or fact, if it has to do with Scientology, it’s probably ably documented by Reitman here–but without the “spin” that the CoS likes to put (or litigate) onto any coverage that has to do with their faith. I don’t want to spoil the book too much, but I will say that Scientology is called “America’s most secretive religion” in the book’s title for good reason. There are a lot of secrets—and even more scary tactics used to intimidate critics, skeptics, and defectors–and none of these reflect well on the faith or its followers. Further reading: If you’re more interested in the media and Hollywood-influencing side of Scientology, pick up Lawrence Wright’s recent Going Clear: Scientology, Hollywood, and the Prison of Belief (2013). Don’t be surprised if you give extra side-eye to celebs associated with Scientology after you read this book. So many words, so many books! Readers, what are your favorite books about topics that you find endlessly interesting — or about religion?